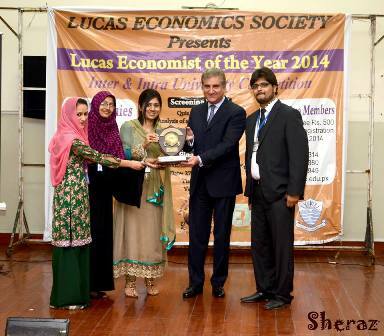 Lucas Economics Society in collaboration with Lahore Stock Exchange and Punjab Economic Research Institute (PERI) hosted an intra and inter university competition ‘Lucas Economist of the Year, 2014’on 26 and 27 March 2014. The screening round of the competition involved a quiz competition and analysis of an economic situation. 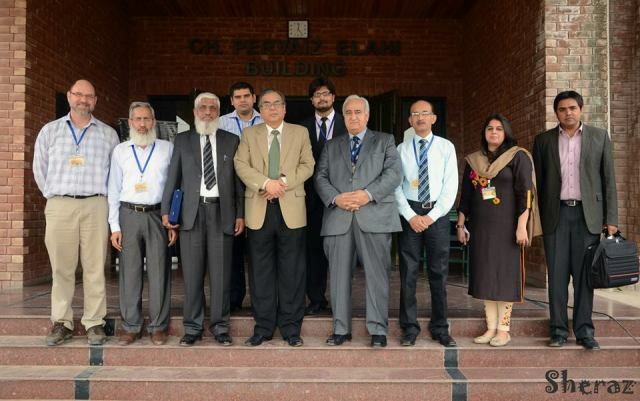 12 teams from FCC and Forman Christian College and 12 teams form other institutions from across the city like Kinnaird College for Women, University of Management and Technology, GCU Lahore and Hailey College , Comsat and GCU Faisalabad participated in the event. Three teams with the highest scores in the intra and inter category respectively proceeded to the next round of the competition where they had to give a presentation on a pre-assigned topic. The intra university competition was won by the team of Hassan Jahanzeb and Faizan Imtiaz who gave an insightful presentation on the Youth Loan Scheme. 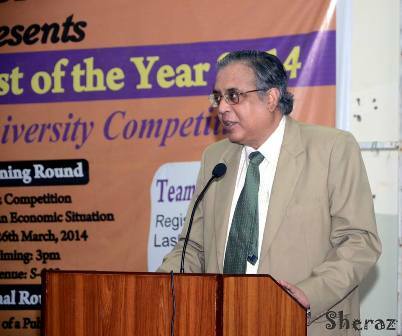 This session of the competition was judged by Dr Abdul Quddus, Director Punjab Economic Research Institute (PERI). Dr Hafiz A Pasha distinguished Formanite and economist was the Chief Guest. While addressing the audience he greatly appreciated the participants for their hard work. He also provided positive criticism for each presentation and encouraged the department to continue arranging such events in the future. Dr Pasha mentioned the strong alumni association of FCC, saying that it has produced the country’s many top politicians and leaders, an achievement that has been undervalued and needs to be highlighted. Dr Abdul Quddus also appreciated the participants for their great work and provided helpful critique for each presentation. LES also held a cake cutting ceremony to mark FCC’s 150th Anniversary. 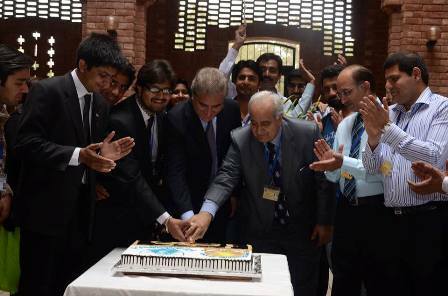 Distinguished Formanite, Former foreign minister and the Chief Guest for the event, Shah Mahmood Qureshi cut the cake and recalled his time at FC College as one of best times of his life. 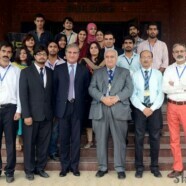 Three teams from GCU Lahore, Hailey College and UMT proceeded to the final round of the inter university competition. 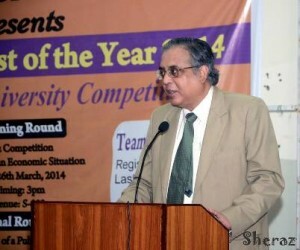 This session was judged by Dr Rizwan Yaseen from Government College University Faisalabad. 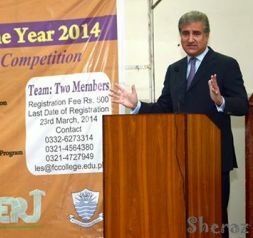 Sidra Awais and Maria Javed from Hailey College presented on the topic of Rescue 1122 and won the competition. 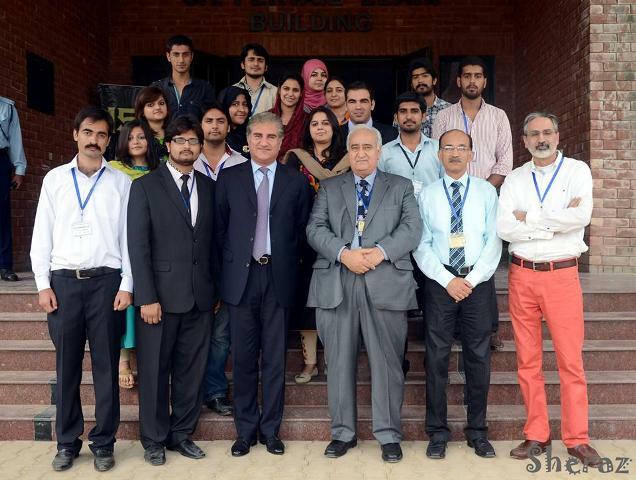 Later, Shah Mahmood Qureshi addressed the audience and lauded the participants for the amount of hard work they had put in their presentations. He specifically appreciated the women who participanted in the competition and stressed on the need for female and youth empowerment and its importance in the economic prosperity of Pakistan. Mr Qureshi also commended the participants for their objective analysis of the three public sector programs, Youth Loan Scheme, Rescue 1122 and Benazir Income Support Program. 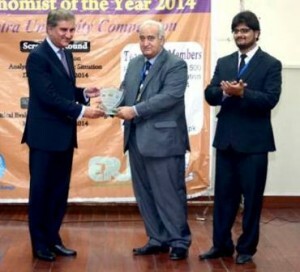 Moreover, Mr Qureshi talked about expanding the job market and creating better job opportunities for the youth, saying that he envisioned a future for Pakistan where youth would decline foreign job offers in place of local job opportunities. 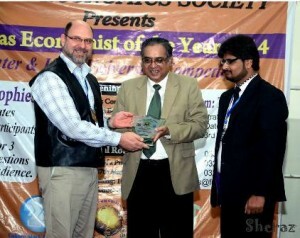 He also urged the society for organizing such events in the future as well.